If your future includes a move to Los Gatos, check out Meathead Movers! Our professionally trained student-athlete movers, moving concierge, and princess packers are prepared to get you safely moved into your new Los Gatos home. When you make your move to Los Gatos, be sure to contact Meathead Movers. No matter what type of moving service you need, our student-athlete movers are ready to handle all your moving needs. If a move to Los Gatos is in your future, we are the moving company for you! Our professionally trained student-athlete movers and our move concierge are here to help you with every stage of your move in Los Gatos. 60 miles south of San Francisco, Los Gatos is a lovely community for those looking to live in a suburban environment while still being close to cities like Santa Cruz and San Jose. Its great location makes it an ideal place for those looking to commute into San Jose for work, while still being able to enjoy a relaxed life near the Santa Cruz Mountains. With beautiful wooded hillsides, flowing creeks and streams, Los Gatos is a picturesque town to live in. Nature lovers can enjoy the many parks or Los Gatos Creek Trail. Historic Downtown Los Gatos is also a great place for residents to enjoy. Its quaint boutique shops, tasty dining, and beautiful historic buildings make downtown Los Gatos a lovely place to visit. 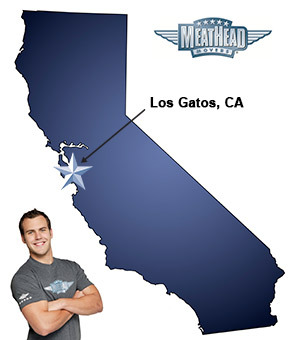 If you are considering moving to Los Gatos, Meathead Movers is here to help! Our moving company specializes in both local, long-distance, and commercial moves to, from, or within Los Gatos. We also provide reliable packing, storage, on-site relocations, and our distinctive moving concierge service, which connects you with local service providers. All our student-athlete movers are thoroughly screened and trained before their first move. With branches not just in Los Gatos, but all throughout California, we are your one-stop resource for all your moving needs, no matter where your California move takes you. In fact, you can see what your neighbors in Los Gatos have to say about us. With our 100% satisfaction guarantee, the only thing you have to lose is the stress that comes from moving! So contact us today for a free no-obligation moving quote and to learn how we can help you on your next move! Moving to Los Gatos? Here are some helpful resources. View more Los Gatos resources. The young men who moved our belongings were efficient, polite and very careful with our furniture. The office personnel were also very easy to deal with. The three young men who did the actual moving were very nice. Their names are: Zachary DeVries, Chris Graham, and Henry Tieche. Mr. DeVries, the team leader, was present at both the packing and unpacking. He was clearly experienced and in charge of the operation. He also has a good sense of humor which helped make moving day much less of an ordeal. All our things showed up at the destination undamaged and the movers carefully followed our instructions on where to place objects. The movers were extremely careful with all items they moved. Most impressive was their positive and patient attitudes. They made the move less stressful than it could have been!